Merriam-Webster's definition of 'Free Will' is, "the power of acting without the constraint of necessity or fate; the ability to act at one's own discretion." The religious and biblical definition is a bit murky, as it implies: "Free will is a precious gift from God, for it lets us love him with our 'whole heart' because we want to." One bible scripture states, "You must love Jehovah your God with your whole heart and with your whole soul and with your whole mind." - Matthew 22:37. "You must love Jehovah!" There goes free will. So what if we don't want to "love God with our whole heart?" Free will is nullified because this ecclesiastical mandate is predicated on us loving a Creator. No one alive, past or present, regardless of his canonical pontificating, has any ideal whether the apostolic God of the Christian holy book or Allah of the Koran actually exist. The concept of free will from a religious perspective signifies the essence of pious irrationality. 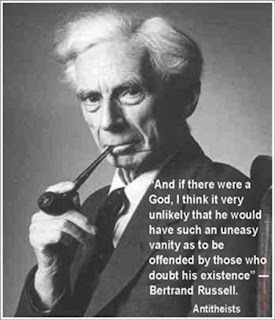 "And if there were a God, I think it very unlikely that He would have such an uneasy vanity as to be offended by those who doubt His existence." "The fact that an opinion has been widely held is no evidence whatsoever that it is not utterly absurd." Before the Christian, Islam, or any apologist of pseudo sacred writings attempts to dismiss the two aforementioned quotes, take a look at the late Dr. Russell's credentials: British philosopher, logician, mathematician, historian, writer, social critic, political activist and Nobel laureate. The 1950 Nobel Prize in Literature was awarded to Bertrand Russell, in recognition of his "varied and significant writings in which he champions humanitarian ideals and freedom of thought." Compare Russell's intellect - common sense, experience, along with the fact that he never asked his audience for money - to Graham, Robertson, Osteen, Jakes, White, Hinn, Creflo and other evangelical shysters who amass tremendous wealth via gullibility and fear, and the meritorious juxtapositions are not even close. 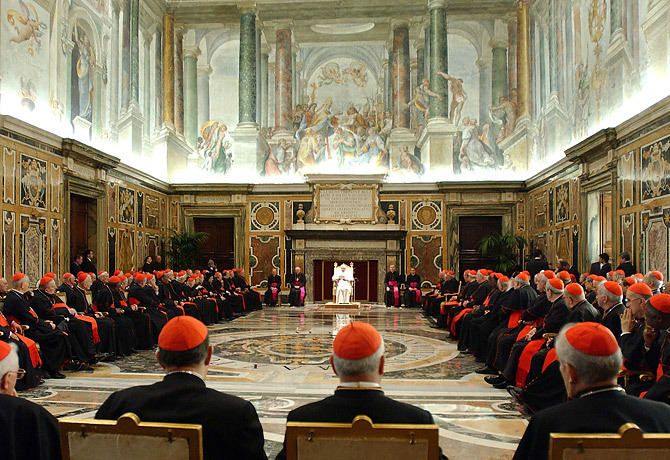 Throughout history, religion has been used to financially manipulate the global population. Dating back to the First Crusade (1095-1099) Christianity and Islam have fought wars to control the region dubbed, "The Holy Land" while molding the minds of billions of converts, initially catechized by force. "The Crusades were a series of religious wars between Christians and Muslims started primarily to secure control of holy sites considered sacred by both groups. In all, eight major Crusade expeditions occurred between 1096 and 1291. The bloody, violent and often ruthless conflicts propelled the status of European Christians, making them major players in the fight for land in the Middle East." 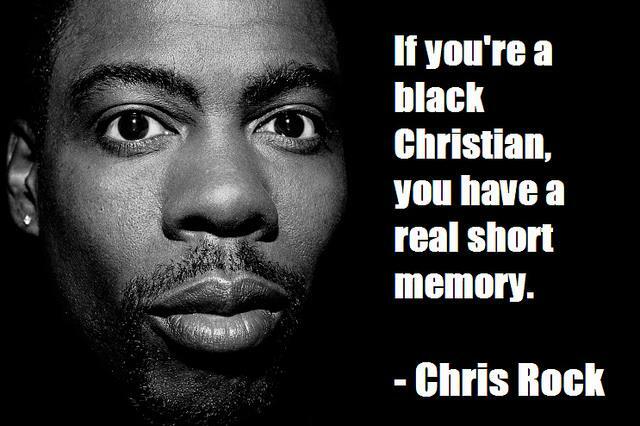 Millions of African−Americans are Christians today because their ancestors were converted against their will to the religion of the slave-master. Hundreds of thousands of American−Indians are Christians today because the Christian missionaries converted their ancestors against their will. Ditto for Europe. When Rome controlled most of the world, the Roman Emperor Constantine in 325 CE, forced Christianity onto his subjects. "Christianity was a minority religion during much of the Roman Empire, and the early Christians were persecuted during that time. When 'Constantine I' converted to Christianity, it became the dominant religion in the Roman Empire. In the view of many historians, the Constantinian shift turned Christianity from a persecuted religion into one capable of persecution and sometimes eager to persecute. There are a number of examples of forced conversion throughout the history of Christianity: during the Roman Empire, in the Middle Ages, Inquisitions in Spain and Goa, and campaigns by Russian rulers." Those who identify with Christianity may want to do a little research on 'Constantine the Great', the architect of their macabre belief system. Constantine the Great executed his son Crispus in 326 CE, at the age of twenty-one. In the same year, because of his guilt in killing his son, 'Saint Constantine' executed his wife, Flavia Maxima Fausta, by "suffocation in an over-heated bath." "The Emperor ordered the damnatio memoriae [condemnation of memory, meaning that a person must not be remembered] of his wife with the result that no contemporary source records details of her fate." October 782 CE: During the Saxon Wars, Charlemagne, King of the Franks, forcibly Roman Catholicized the Saxons from their native Germanic paganism by way of warfare and law upon conquest. The Massacre of Verden saw the mass execution of 4,500 Saxons under order of King Charlemagne. "The Christianization of Lithuania occurred in 1387, initiated by King of Poland and Grand Duke of Lithuania Władysław II Jagiełło and his cousin Vytautas. It signified the official [forced] adoption of Christianity by Lithuanians, the last pagan nation in Europe. This event ended one of the most complicated and lengthiest processes of Christianization in European history." The people of Lithuania did not become Christians because they read the gospels and decided to accept their teachings. On the contrary, the people of Lithuania were forced into Christianity against their will, as a result of relentless military force. Upon converting to Christianity in the 10th century, Vladimir the Great, the ruler of Kievan Rus', ordered Kiev's citizens to undergo a mass baptism in the Dnieper river. In August 1552, forces of Ivan the Terrible, operating from the Russian castle of Sviyazhsk, laid siege to Kazan. The Muslim population faced slaughter, expulsion, forced resettlement, and conversion to Christianity. The forces defeated the Tatar inland troops, burnt Archa and some castles. On October 3, after two months of siege and destruction of the citadel walls, the Russians entered the city. Some defenders managed to escape but most were put to the sword and the population was slaughtered. The Kazan Chronicle reports about 110,000 killed. "In addition to being a horrible animal-torturing and rival-executing scoundrel, he was also a very devout Christian. He ordered reforms to be made that would further Christianize Russia. He would sometimes go into fits of religious devotion, confessing his sins or banging his head against the floor with the same eagerness that he showed when slicing open live birds." Jews endured the wrath and forced hand of Christianity as well. Millions of Jews from the fourth century CE until the 20th Century were forced to "kiss the sword" of Christ, or be put to death by that sword. Therefore, many Jews died at the hands of Christians in the name of Jesus. 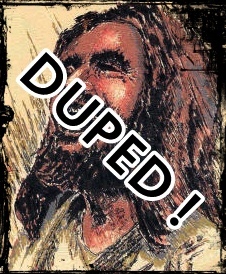 Fortunately, many Jews managed to survive by lying - saying they converted, but secretly remained Jews. The Christian Church finally realized what was happening and in 1492, the Spanish Inquisition tried to purge the country of these "Secret" Jews, called Marranos. To bring the article writers point home regarding Christian terrorism, listed below are ten of the many atrocities associated with the Goa Inquisition. Indigenous people were forced to adhere to Portuguese religious beliefs, abandoning their faith. Goa Inquisition was almost on par with Inquisition in Spain 1478, in terms of gory treatment and violence in the name of religion. The new Christian Missionaries from Portugal mandated that all Hindu temples be closed by 1541. The beautiful Goa enclave with fine beaches and azure waters, in particular, became a horrible place of horrors of unimaginable proportion just for the simple reason that the natives refused to accept Portuguese religious beliefs and refused to get converted under compulsion or duress to Christianity. It is a paradox that Francis Xavier, the devil in the guise of a priest, who forced the King of Portugal to legally introduce the Inquisition in Goa and ordering the torture of tens of thousands of Hindus and Jews, using various innovative methods, was canonized by Pope Gregory XV in 1622. The preachers used many dreaded methods of torture to force the innocent people to swallow their preaching of Gospel. According to Richard Zimler, who wrote "Guardian of the Dawn," on the Inquisition in Goa mentioned the missionaries used the “machinery of death” for forceful conversion. Using torture, people were required to pass the ‘act of faith’ (auto-da-fe) by being stretched out on the rack; if they failed they would be burnt at the stake. Dismembering children limb by limb in front of their parents whose eyes were taped continued till they agreed to convert was the most cruel method used by the catholic faithful and they found this method very effective. Death awaited those non-Christians or heretics (kept in shackles by priests) who refused to give up their faith or divulge the names of those who are non-Christians. Death was by strangulation or burning alive in public. These atrocities continued until 1812 when the Inquisition was finally abolished. Those who persistently refused to give up their ancient Hindu practices were declared apostates or heretics and condemned to death. In 1736, over 42 Hindu practices were prohibited. Christianity should not take pride in their large numbers. In fact, the collective feeling of all who subscribe should be one of unmitigated shame. Practically all Christian ancestors of Catholics, Protestants, Jews, Hindus, Persians, Indians, Native and African Americans, had no choice in the matter. Either accept Jesus as your savior or face a brutal death. In the 21st century, Christianity is aggressively introduced in a non-violent manner, via an army of missionaries beating on your door and brainwashing your children in school classrooms, extracurricular activities and intramural sports. There have been a plethora of forced conversions throughout the history of religion. Christianity and Islam have been at the forefront - primarily Christianity. 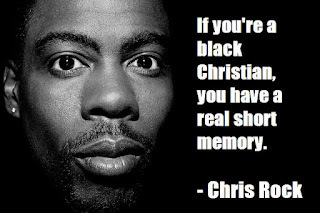 There are so many more examples as to why Christianity is the "fraud of the age."